Gary Vaynerchuk: Author of The Thank You Economy and Future Owner of the NY Jets? Two weeks ago Peter and I attended a Biznik event featuring the social media expert and entrepreneur, Gary Vaynerchuk. Besides the fabulous Theo Chocolate, and wine provided by Chateau Ste. Michelle, the true highlight of the night was listening to Gary Vaynerchuk’s explosive presentation on his newly released book: The Thank You Economy (TYE). To be completely honest, I had never heard of @garyvee until Peter sent me the event invitation. However, within seconds of listening to the guy speak I was hanging off of every word he said. Gary Vaynerchuk launched his online wine retailer in 1997, Wine Library– what is now a $60 million dollar business. More impressively, @garyvee has created quite the brand for himself by using the available web 2.0 resources to their full capacity. @garyvee engages his followers, fans, and customers in a truly remarkable way- all 868,000 of them. The Thank You Economy is clearly working for Vaynerchuk. So what exactly is the The Thank You Economy? Well here’s my take on it- social media has provided us with the tools needed to create the same lasting relationships with our customers- just like the small town mom-n-pop businesses use to do. Yes, it takes a lot of work, and isn’t entirely measurable. However, it’s the only way to stay relevant in 2011. The Thank You Economy is about creating the wow-factor for your customers, going the extra mile, coming from the heart, and the strategy of doing it through social media. Businesses who are using social media as just another form of PR are wasting their time. In order to live in the TYE you must engage, create community, and truly care about the individuals who interact with your brand. It’s also important to remember, you have to crawl before you run, and quality is always better than quantity. Somewhere in the middle of @garyvee’s presentation he stated, “The amount of self esteem I have in my body should be illegal,” and I truly believe it. The guy exudes confidence with his personal brand, and his trust in the TYE. Vaynerchuk’s TYE explanations put several of my lingering thoughts into words. At the event he asked, “How many of you can’t remember the world before the internet,” and well, I was the only one who legitimately raised their hand. After finishing the book, I was inspired beyond belief. At the end of the event, @garyvee was signing book copies for the event attendees. Peter and I mingled around the room while we waited for the crowd to die down. When approaching him for signatures with our book copies, we took the opportunity to ask him about his very public goal of owning the New York Jets. Vaynerchuk has been a Jets fan since he was a little boy. He explained how there are three factors that will determine if and when he will buy the New York Jets. Whether or not the Jets win a Superbowl (they haven’t won since 1969). Vaynerchuk described how he loves the climb and what goes along with rooting for the underdog. If the Jets win a superbowl, it will take that element of fun out of it. The owners actually wanting to sell the team. And there you have it! 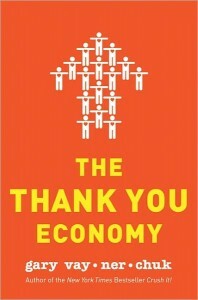 I definitely recommend picking up a copy of The Thank You Economy. After the event, I instantly dove right into the book and finished it in only four short bus rides. It’s a wonderfully entertaining read, and it really drives home the reasons why we spend (or should be spending) so much time tweeting- effectively that is. Gary Vaynerchuk and Peter sporting TYE wristbands! https://thinkspace.com/wp-content/uploads/2013/11/website-thinkspace-logo-teal-155x69.png 0 0 thinkspace https://thinkspace.com/wp-content/uploads/2013/11/website-thinkspace-logo-teal-155x69.png thinkspace2011-04-01 08:15:152011-03-31 16:31:10Gary Vaynerchuk: Author of The Thank You Economy and Future Owner of the NY Jets? Overcoming Adversity – Reon Schutte’s Story in a Zimbabwe Priso... What is Servant Leadership and Why Should I Use It?